Fashion trends for men have evolved in recent years as a slimmer, more athletic fit has become the standard in everything from suits to t-shirts. This more stylish look has also had an impact on the usually stodgy golf world, as younger golfers have made their mark on the tour. Sub70 sent us some samples from their golf line which embraces these new style trends as the “classic golf shirt goes modern.” Check out their site and you’ll see a wide variety of European-fit polos in a full range of styles and colors. We checked out the Zane/White golf shirt pictured here and loved the styling. Some of the shirts are trendier than others but the modern styles definitely stand out as something new and fresh. The all-polyester shirts are very comfortable, but they are definitely tighter and the sizes run smaller than expected. They are ideal for a leaner and more athletic build, so it’s not for guys who consistently choose beer and the buffet line over the gym. 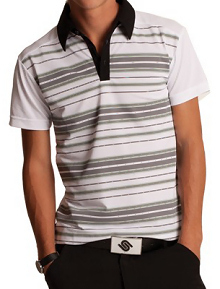 The shirts make a great gift for golf enthusiasts who have a sense of style. If you’re an avid golfer and want to break free from the more traditional look, these shirts are for you as well. If you’re looking for gear with some attitude you’ll love the t-shirts and other products from Ranger Up. Ranger Up is a military and patriotic apparel company run by veterans with attitude and swagger. They sent us some t-shirts to try out and we loved them. The quality is excellent as the pre-washed and shrunk t-shirts are soft and form-fitting. The shirts also tagless for better comfort. The screen printing quality is also excellent and there are tons of cool shirts to choose from. Regardless of your political leanings you can find stuff you’ll like, but the in-your-face attitude is reflected all of the phrases and designs. You’ll also find MMA gear as the entire line is consistent with that style. Browse though the selections and you’ll get a feel for the aggressive styling. The shirts will also motivate you to hit the gym as they will show off your assets and also expose any flab in the midsection. Try out one t-shirt and you’ll likely come back for more. Also, the Ranger Up gear can make a great gift this holiday season for men and women. With ESPN’s Body Issue getting a lot of publicity, now is a great time to think about your own fitness as we head into fall. Many of us fall into the same patterns. With summer on the horizon, men and women start working out in May with the hope we will look good on the beach or by the pool. Late in the year, the holidays come around, and everyone eats too much at all the parties, and then you wake up on January 2nd looking and feeling bad again. It’s time to break that cycle. This year, try to be proactive by committing to working out and eating right during the fall and into the holidays. It’s a great time to develop good habits that will stay with you through the year. Think about starting some new exercises. If you haven’t been doing weight training, then maybe this is a good time to start. Also, if you’re going to try something like more weight training, then take a look things like protein powder. Protein is important if you’re serious about building muscle, but keep in mind that overall nutrition and eating habits are equally important. Protein powder should supplement your diet. Do your research, read Mike Furci in our Fitness Channel and consult your doctor or a nutritionist, but things like whey protein and fat burners are very popular with people looking to get in shape and look fit. It’s also a great time to focus on cardio. Many people lose sight of this as the weather gets bad. They stay inside and get less exercise. Now is the time to be consistent and get your cardio in the gym. Find out what works best for you. Some guys like the treadmill, while others like the stationary bike. The key is whether you want to commit yourself to looking good year-round. It’s all about your mindset. Let things like the body issue and the photo above be motivation. Then, think about your own goals and put together something that works for you.